Following the success of national Tower Safety Week from 10-14 November, Chris Blantern explains the advantages of using mobile access towers when working at height. When working at height is unavoidable, mobile access towers offer numerous advantages to complete works safely. Towers are uniquely useful for their flexibility of configuration, strength with lightness, and speed of assembly and dismantling. These are all characteristics that make towers as useful in complex jobs as they are in the simple, quick ones for which they are most well known. When talking about a tower’s diversity, it is worth mentioning that even the simplest, most common uses hint at this flexibility. Standard straight-up towers can range from 2.5 metres to a maximum of 12 metres, and look markedly different to room scaffolds, which come in at less than 2.5 metres. 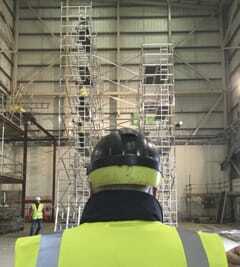 Many different training courses are available for typical tower work and low level access. As much as low level work is a rapidly changing field, the equipment’s real variety can best be seen by scaling up beyond the typical 12 metre straight-up limit. Large deck structures are an obvious example, and have unique benefits. Setting up one large deck structure allows several people to carry out jobs in different areas, since it can cover a huge area. One particularly impressive benefit is that large deck mobile access towers can be moved without being dismantled. One example from a seminar on complex towers was a large auditorium with a temporary suspended floor, in which the structure was built on rails and could be wheeled back and forth if necessary. This example emphasises a unique advantage: the minimal weight of the tower meant it could be used on the temporary floor, something otherwise hard to do for a structure of that size. Other larger tower types include linked or façade structures, which share wood through end frames, allowing access to a whole structure at two metre height intervals. This tower type is ideal for the fronts of large buildings, with the users able to walk the whole way along them. If height is the most important factor, a bridging structure may be useful. These also allow users to work over immovable objects, as the ‘bridge’ section in the centre does not need any support directly below it. This is another case of towers being a great option for buildings with weak floors; for example, bridging structures have been used in cathedrals to avoid the weak central floor above the crypt. High level structures that far exceed 12 metres can also involve fixing the tower to a supporting structure by tying it in, or using a ‘buttress tower’, which offers stability by having a much larger base than the tower’s top. These can also be easily repositioned without dismantling. Also worth considering are cantilever towers. These offer a platform extending out from the sides, for example, to work on guttering or to offer a wide working area at the top. They also feature stepped structures, with bases set at different heights. As well as being used on staircases, stepped towers can also be used in swimming pools, with one end of the tower underwater, providing support to work at the top of the building. None of these tower types are necessarily exclusive from each other. It is not unheard of for tower users to create, for example, large decked bridge structures with cantilever platforms and stepped end frames. After learning all of these options for towers, all that remains is to be creative. Towers come with prefabricated parts, which help to ensure that any sensibly built tower type will be safe. All of the tower types outlined here have been possible for some time now, but a number of more recent and upcoming changes mean that there has never been a more promising time for people to safely take advantage of the potential of complex towers. Most importantly from a safety perspective, is the current revision of BS 1139 Part 6, which is aimed for release in 2015. A British standard dealing with these equipment types, its full name gives a clear idea of what it is responsible for: ‘Metal Scaffolding - Part 6: Specification for prefabricated tower scaffolds outside the scope of BS EN 1004, but utilising components from such systems’. BS EN 1004, or simply EN 1004, is the UK standard that usually applies to mobile access towers. It has been championed in 2014 as it offers protection for people working at height in a way that non-compliant towers do not. Towers that are not manufactured to meet the EN 1004 standard, often referred to as ‘domestic’ or ‘H-frame’ towers, represent a serious risk to users. Typically, they can be made from painted or galvanised steel, and, among other issues, may use loose scaffold boards or DIY platforms. These could break or move, have no built-in access to ensure safe ascent and descent, and could come without the correct size and quantity of stabilisers to prevent overturning. In contrast, EN 1004 towers have purpose-designed platforms with safe trapdoor entry and exit, offer built-in access, come complete with the necessary stabilisers, and have the required number and type of guardrails to prevent a fall. Checking for the EN 1004 label is the best way to be sure that this range of minimum standards is met. The problem then comes when complex tower types are being built. EN 1004 was not created to deal with the likes of bridged, large decked, high level structures, and otherwise safe EN 1004 towers can become dangerous if incorrectly used in these advanced ways. That is where BS 1139 Part 6 comes in. People know it is safe to use parts in complex ways as long as they meet the standard. Work has involved changes to the standard that make its scope clearer, better defined, as well as offering more in-depth information and new requirements. Its release, likely in the early part of 2015, will make advanced towers safer and simpler to use than ever. Of course, the standards the components meet will not have a very large impact if the people using the towers are not trained. It has grown increasingly common to hire a company to provide advanced structures and assemble them, and for this reason PASMA has created the new hire and assembly membership type for companies that aim to provide this advanced service - putting up towers that only experts in the field are fully capable of assembling. Many of these members were involved in the creation of the Towers for Riggers training course. Towers for Riggers is the newest addition to the industry standard training scheme, and by requiring new members to have their staff go through it, the association ensures that there is a reliable place to find professionals who can safely assemble advanced towers. Clocking in at five days of training held over a week, it is by far the longest and most in-depth training course overseen by PASMA. Other courses are stated to appear next year, offering the potential for the various unusual tower uses explained in this article to become more common. Upcoming courses will allow delegates to learn how to use some of the advanced configurations without having to devote a week to the full programme mentioned previously. Separate courses designed for this purpose include those targeting towers on stairs and towers with cantilevers, which give an in-depth look at these specific tower types. Courses are also being designed aimed at those who supervise and are responsible for tower use, rather than those directly using them. Low level access training emphasises guidance on specific techniques aimed at people using low level work platforms (LLWPs), often called podiums or pulpits. With key messages including “accidents can happen even at low levels,” there has been a recent drive to make increasingly popular low level platforms safer. A minimum safety standard for LLWPs has now finally been set for the first time. This safety standard was published as a Publically Available Specification (PAS), and was known as PAS 250. Under licence from the British Standards Institution (BSI), it aims to become a full British Standard in 2015. The specification still requires a great deal of promotion to help ensure that podium users are aware of the standard and comply with it, and that companies offer their employees the safest equipment for this type of work. Towers are capable of all kinds of work at different heights, but low level access is uniquely placed for improving safety. RIDDOR statistics in the past have shown that falls from low levels account for the majority of injuries from falling. In addressing issues of working at low levels, it is hoped that injuries and fatalitites will see a decline in 2015. Much of the work undertaken to ensure safety is based on the idea that being trained in the industry standard course or being a member of the appropriate association is the best way to prove that a person or company is competent and safe. There is, therefore, always the potential that people can lie about their connection with an association to falsely appear to meet standards. In a recent focus on technology, there has been an attempt to reduce the risk of this counterfeiting. New photo cards brought in this year were the most recent of these attempts, with a range of cutting-edge techniques such as UV lighting and drizzle ink. These anti-forgery measures offer peace of mind without the need for sites to invest in sophisticated electronic card readers. One of the next innovations for bolstering safety by combatting fraud is to invest in logo protection software. New developments in logo software mean it is possible for customers to confirm that the logo is being displayed by a genuine member of that company – simply by clicking on it. Some organisations are rolling this out as the only accepted logo for members to display. In the past there have been a number of websites that use organisations’ logos without prior permission, in particular to make their product or training appear more widely accepted. This new technology gives people a simple way of avoiding these training providers. Similar logos for other membership types are currently being looked into, meaning that people will be able to know with certainty that they are employing as safe an option as possible to assemble their complex tower structures. As recommended by the UK’s Health and Safety Executive, when a tower is purchased or hired it should arrive with all the necessary components to prevent falls and ensure stability. Rigid, competently erected platforms with secure guard rails around the edges should be sufficient to control against the risk of falling. If a worker is required to reach out past the secure guard rail, however, this may give reason to wear a work restraint harness that is securely anchored, so that the person cannot get into a position where a fall could occur. It may also be pertinent to wear a hard hat when the access tower is erected on a construction site, to protect against the risk of materials being dropped from above. It’s an exciting time for height safety. There is now a greater global awareness of tower safety than ever before, and the new safety standards currently underway hold the promise of improved safety for all workers using, erecting and dismantling access towers. Still, this will only be possible when equipped with knowledge, protection and alertness to our surroundings. Between the potential for diversity and complex structures to grow more popular than ever, the promotion of towers for low level access, and the industry confidence that comes from the support of a globally growing association, 2015 is set to be a remarkable year for towers. The safety and ease of working at height is increasing all the time, and towers remain capable of staying at the forefront of that increase.